East West | Travel Blog by Kunda Dixit | Nepali Times | nepalitimes.com » Blog Archive » Once is not enough? Yet another crash. Yet more tv visuals of police and army searching the scattered wreckage. Once again, bodies being unloaded from the army chopper at the airport. Reporters interviewing grieving family members. The news beamed worldwide. And once more: the questions about aviation safety. How could this happen yet again? The inevitable speculation about causes: pilot error, air craft malfunction, lax enforcement of aviation rules. Up on the ridge of Kot Danda on the eastern rim of Kathmandu Valley on Sunday morning, the clouds hung low and those questions sounded banal, almost callous. The lifeless forms of passengers with horrific bruises were being ferried in stretchers to a waiting helicopter. Amidst the wreckage, a ladies’ shoe, a camera bag, bits of clothing and shredded seats. The army rescue helicopter had finally landed nearby after circling to find a gap in the clouds. Hundreds of people from surrounding villages gathered immediately, sometimes blocking rescue vehicles with their motorcycles parked in the narrow road leading to the accident site. The Buddha Air Beechcraft 1900D with 19 people on board, including three crew, was returning halfway from a Mt Everest sightseeing flight because the mountains were covered up by late monsoon clouds. There were two other aircraft ahead of the Buddha Air, and the pilot appears to have flown lower than he should have to keep below the cloud ceiling. He was also too far to the east probably to keep distance with preceding traffic. It hit the steep south-facing slope at about 7:21 am. On the vertical wall of a terrace farm there is a long scar ploughed by the right wing of the plane as it hit. The gash is at an incline, indicating the crew may have been trying to pull up at the last moment. 40m on another side of the mountain. Further inspections have to be carried out of both engines, the black box and cockpit voice recorder will give an indication of any malfunction. 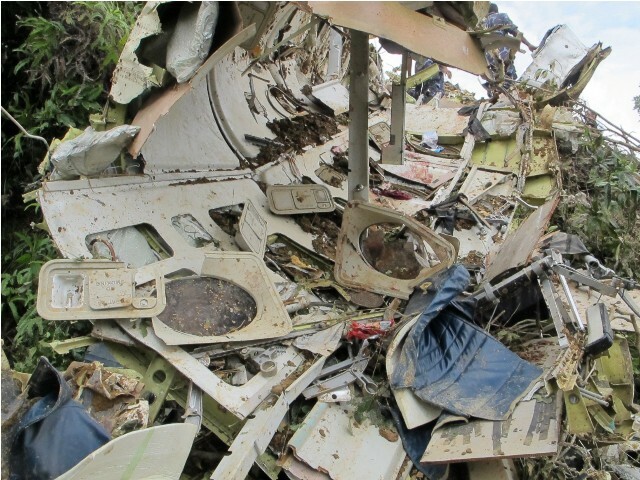 But the crash had all the hallmarks of what aviation safety experts call Controlled Flight Into Terrain (CFIT). mountains covered in clouds it becomes even more hazardous. know exactly where you are because clouds have rocks in them”. It is not supposed to be a joke. Too many lives have been lost to preventable crashes. Too many lessons have been not been learnt. Too many investigation reports have just gathered dust. No air crash has only one reason, usually it is a combination of factors. In Nepal it can be weather, terrain, lack of training, pilot error and the lack of equipment. New equipment like state-of-the-art satellite-based ground proximity warning systems on board, or the new RNP-AR approaches to airports in mountainous terrain would make CFIT less likely. The human factors are not just to do with the pilots, it is about airline policy that recruits pilots depending on whether or not they can afford to pay up to Rs 2.5 million for their simulator training and conversion licenses. Salaries and poor pay mean the best pilots migrate to work in foreign airlines. I agree with Mr. Dixit, We are expert in blaming game, we dont see the human possible errors, we simply blame the weather. As far as we can easily guess an unprofessional pilot leads such type of disaster due to the lack of professional piloting. We made same mistake again and again. now its enough we should reform the whole Aircraft industry of Nepal whereas we can eliminate such type of upcoming disaster again. R.I.P to all those people….May their soul rest in peace. what about skyline airlines on december 25 1999? Your list seems incomplete! “Once is not enough” covers all the relevant issues related with air accidents and the aviation business. The media and the public have raised voices for the Safety measures to avoid such unnecessary loss of lives but the concerned seems least bothered about their responsibilities. No accidents happen suddenly, it is a series of mistakes that multiply which leads to the incidents. Now what happens is the formation of a so called “investigation committee” consisting of the men who are and were in the MOTCA or CAAN. These men have been very friendly and worked with the airlines for so many years and have friends and colleague still working at the Ministry or various department of the civil aviation. How can you expect such an investigation team to properly accomplish their duties? I do not trust them and so suggest that other organization or individuals should be inducted to have a fair and just investigation. There is a non-profit making organization called Nepal National Aviation Council (NNAC) who may be an alternative. Thank you. When I studied Airport engineering. We had a rule that the plane should have clear view up to 10s of kilometers to naked eye. There are several imaginary surfaces on either side of the flying path so that pilot has a clear vision on either side. I might studied the airport engineering for air ports in plane land, but the idea holds true for airport and flights in high mountains like in Nepal. A few years ago, I talked to a pilot in domestic route what had really happened in last 10 years or so after we allowed private airlines to operate and there are so many accident. The pilot told me that he has to fly the airplane with manual / naked eye based judgement, and there is always a competition between airlines to take more passengers. So, the clear distance between two airplanes needed some distance, and the pilots used their own decision to fly low to minimize the time. That was the reason for several crashes in the early days of private airlines in Nepal. Well, in some routes like to Pokhara, they have now established an understanding that while you go to Pokhara from KTM, you follow one route, and return from another route like cars in two lane highway. That had minimized the accidents along Kathmandu Pokhara route. It happened after a plane hit a communication tower near Thankot. Another technology, that we already have is the night vision camera in place. In our video camera it does not work in day time, because some early customers of Sony (the pioneer of night mode) used it to take video people in wet situation e.g. around swimming pool in day time, and everyone was seen naked, and sony took the remaining units in market back and issued night mode that really works only in real night. But, scientists and engineers still use night mode camera with special permission in day time, and I have used it in one site investigation project when we need to know about the cavity under a cement coated surface. Here, what I mean is that the government, and aviation sector can work together with the electronic camera manufacturers to get an appropriate camera for their use and may fit straight into the aircraft, and use the goggles by one of the two pilots if there are two pilots, if not allow the goggles by the lone pilot. Ask Pulchowk campus students to manipulate the video cameras, and they can do it for you. Just provide a research grant, and these kids can do it in a short period of time. It is just infrared that you want to send and hit the mountains and map the path of the aircraft. Not a big deal in this century. You need a will, and resources. Well, safety should be number one. No compromise. Ethics, moral and integrity should be always cross-checked. There should be enough vacation for the pilots. There should be regular professional development seminars for the employees including pilots. Owners should be punished if they pushed hard on pilots. So what we need? Law of the land in action. Unfortunately, like in old saying, “Law is now name of which bird, in Nepal”. When the country is run by thugs, killers, and gangsters who highjacked people’s frustrations, went on killing spree, and got the government, how can you maintain public safety? I am not sure. This is sign/ preview of failed nation. Do something now, or you will face more disasters. SAFETY ENGINEERING COURSES IN ANY OF THE UNIVERSITY IN NEPAL. THIS IS CRUCIAL NEED. WORLD HAS ACHIVED UP TO PHD AND WE HAVE NOT STARTED YET. LOOK THE BROAD SCOPE WITHIN NATION AND ABROAD. PAST IS A GOOD LESSION MASTER. You are master of your words and i bow down to you. You utterly smash the pumpkins of this poor system of recruiting pilots. Though i may not blame pilot only here. It is the whole corrupted system scratching beautiful layer of the fake govt. I loved reading your writings. thank you being true.. The Skyline Airways flight from Simra to Kathmandu crashed on its return flight with 10 passengers on December 25, 1999 when the Indian Airlines flight was also hijacked. I was the Executive Director then. I just want to share one another factor that is responsible for plane crashes. The situation inside the cockpit of the aircraft meaning the relationship or compatibility of the captain and the co-pilot some time play out a horrible incident. The then OD of Skyline did not realize that while preparing the flight roster of the crew, Ashis Pant the Captain and the co-pilot Prasain were not friendly and had problems regarding the issue of seniority which lead to the crash. Another incident was the crash of Lumbini Air’s flight from Jomsom to Pokhara where the Captain and the co-pilot had heated argument on their return flight from Jomsom to Pokhara which might have been somewhat responsible for the crash. I was then the Marketing Director of that airline. so the airlines operators must be very careful about the mental conditions of the Pilots and co-pilots so that their personal problems do not interfere in the performance of such delicate and risky jobs of flying aircraft full of passengers. Operators have huge responsibility for the sake of so many lives. Thank you. I think our pilot qualification, certification and recertification should also be looked into. There was a time (may still be happening) when many youth who could afford or has no real inclination towards doing a hard work or study even fancied pursuing a pilot training abroad just by seeing how the pilots command respect. Many had no idea how much real hard work and dilegence, commitment are needed to sustain it after the training. Being a pilot is not just sit on the cockpit and push those innumerable buttons and cite jokes in a bar in the evening on the ground. One has to be ready all the time while flying to make a last minute decision that will save the lives. Is your mental and physical condition upto it? Should you go to fly in the morning after an all night partying or playing paplu and tiplu? I have to say that the attitude of a few I know I would not even trust them as my chauffer on the ground much less on the air. When they carry the lives of so many people, we ought to be super cautious with 0 fault. It is time to revisit the pilot requalification through a neutral but professional third party. Old plane and less maintainence may also attributed to it, but the pilot error seems to be the continuing problems in many of the crashes. Very well written article – “Once is not enough”. My inevitable speculation about causes in this case: Miscalculation of the geographical location-altitude; height of the terrain and flight level. Such accidents have occurred previously due to negligence of not following the flight rules: Instrument Flight Rules (IFR) and/or Visual Flight Rules (VFR). I really feel sad about such accidents. Thank you everyone for these very constructive comments that provide solutions about how to save more lives from being tragically lost. It must be noted that except for the Agni Air crash none of the accidents in the last decade have been due to equipment/instrument malfunction as a primary cause. Hence except for that case, in general we can rule out airworthiness or maintenance issues though this might be an issue in future if standards are not maintained. As an insider I do know that a lot of these accidents have been primarily caused by violations of standard operating procedures (SOPs) by the pilot in command. Often I have found to my consternation that an alarming no. of pilot in commands are not fully knowledgeable about the use of such navigations aids as Traffic Collision Avoidance System (TCAS), GPS and Ground Proximity Warning Systems (GPWS) that the aircraft they are commanding are equipped with. I am afraid our Nepali culture of milli-milli kaam garne does not encourage a zero tolerance attitude towards safety regarding pilots. Even when a senior pilot is aware of some incompetencies in their colleagues piloting skills or is aware of violations they are making they keep quiet as they do not think it worth their while to raise these issues for the sake of safety. There was a case of an airline who employed a co-pilot with a well known drug addiction problem for many years. Yet neither his seniors nor the management took corrective action until a physical fracas with a CAA official forced the airlines to dismiss him. There are currently many pilots with alcohol abuse problems still commanding aircraft. There are some owners who actually encourage risk taking in the interests of profit. The Civil Aviation Authority of Nepal (CAAN) I am afraid is a bit of a joke. It’s officials are very poorly paid and more interested in making money from the private airlines than monitoring the safety procedures of the airlines. However in a country where the best paid CEOs of private banks are known to take bribes at the cost of ruining their banks it really isn’t surprising that the airlines industry in Nepal is also lacking people of high ethics and professionalism. It is malaise that is effecting every walk of life in Nepal. There are some new affordable technologies that can help make our skies safer. For example if the ill fated Buddha Air Beech 1900 had been equipped with an Enhanced GPWS (EGPWS) instead of the older GPWS the accident might have been avoided as the EGPWS is much more accurate and does not shut off merely on flaps and wheels down configuration as the GPWS does. I believe some aircraft flying in Nepal already have this EGPWS installed in them. For smaller aircraft such as the Twin Otter there are new FAA approved stand alone GPS systems that give visual terrain warnings suitable for such aircraft flight routes. Used correctly these aids can easily eliminate Controlled Flight into Terrain (CFIT) accidents. In the absence of a functional regulatory and supervisory body it is high time airline professionals took a stand for the sake of safety. Buddha Air has devloped a good reputation as a company over the years. But then again, the MGMT may be distracted due to thier current growth so less incompetent individuals maybe making crucial decisions. The profit factor may also play a vital role in this downturn of economy every where in the world today. But we also need to question the role of pilots and air traffice controllers. What happens after the investigation bythe govt. What kind of change is implemented. Its very sad that all these people had to perish. What if the flight was xxled or delayed based on weather report. So many questions and so few answers. I flew on the mountain flight and I think it should not operate in the monsoon. I too agree with mr mustafa wiki, we are expert in blaming games. Without even knowing the actual fact, the conditions, the statements, with the utter want of participation, we play this blaming game… blame the weather, or so thought unprofessional pilot crew. But sir, do we really have the right to just point out the views without knowing the true facts behind it. Was anyone of us there to see how the weather was, or did anyone check the records of the pilot crew before bringing forward their views? Though a possibility, I doubt that this is a maintenance issue: chances are, this is CFIT (Controlled Flight into Terrain) as pointed out in this well-written piece. 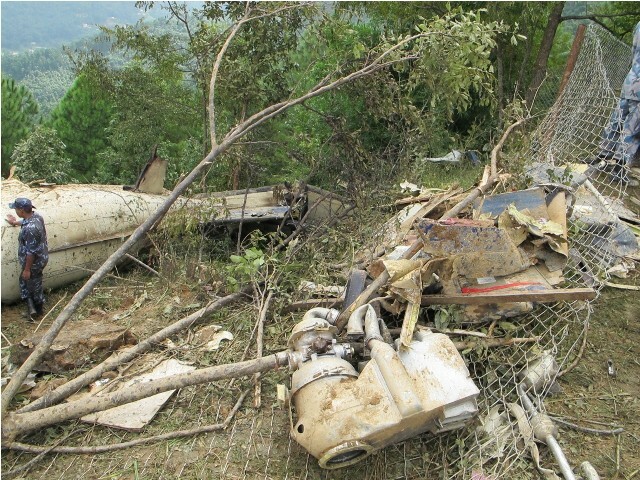 CFIT is the case for most Nepali aviation accidents given our terrain and weather conditions, especially during the monsoons. It is not a question of training but, rather, a question of having TAWS (Terrain Awareness & Warning System) equipment on board our aircraft. Such systems contain a database of the terrain which allows pilots to “see” mountains even during white-out conditions. The issue is cost: these systems are expensive and Nepali airlines do not purchase them. If the government wants real change in this area, they must mandate that all airlines have TAWS or equivalent systems. Thanks for the article Mr. Dixit. I think this date is wrong. I was in Nepal for short trip. It was evening time around 8:30 pm. I was walking with my son and very close to my house. I saw the airplane in sky, and a couple of minutes later there was an explosion on Southern Part of Kathmandu Valley. I had no idea that it was an airplane crash, and after hearing the bang sound, I told my son that it is sky-lightening, and blah blah… Next morning, I came to know that it was not sky-lightening just before rain, but it was an aircraft that exploded. It was not June, it was possibly either August or September. In your table above, the first number is day of the month, and second is date, so 9th of June is not correct, it could be 6th of September. Please correct it. Execellent selection of words for the article ” once not enough?’ If I will be the primer of nepal, it is sure a sum of nrs 1,000,000 will be awarded to Mr K dixit. aircraft.Who will provide solution to problems wher future accident can be avoided by control Mechanism? undoubtedly we have a burgeoning malice in the way airline industries operate. As i can see we have a handful of experts and insiders from the industry here, I hope someone could help me with my concerns. It is very discomforting usually when you are flying from small towns like bharatpur, which shall be the story of all domestic airports i guess, that as soon as the flight has arrived from kathmandu, it is already in the ‘go mark’ to fly back within couple of minutes. I wonder as an ordinary folk wouldn’t a pilot need to relax and rest a bit before getting back to the thin air. One of the problematic issues with the Buddha Air crash on Sunday is that it occurred in an area that is considered relatively safe i.e. while approaching Kathmandu valley. Almost all other accidents in recent years have occurred in mountainous regions operated by Short Take Off and Landing aircraft (STOL)- sectors that are widely acknowledged as challenging terrain. Also this is the first fatal accident involving a non STOL aircraft since the Necon Air crash since Sept 1999. It will be interesting to see what the investigations on this air crash yield. I still say (as I mentioned above) that our pilot certification and recertification is critical to keep the industry safe. I have seen quite a few who have gone through a pilot training abroad without any idea of a real commitment to flying a passenger plane. I am afraid that the pandemic disease called nepotism and ‘afno manchhe’ approach which have plagued our bureacracy and private sector are showing the symptoms of the same in the airline industry also with a human disaster in waiting. Our pilots must go through a rigorous training in aptitude and pass the test of commitment. Where is the feedback from the flying passengers and ATC? The comments made above by many but particularly of Dorje Tshering Sherpa GyanRel and a Airline Professional are note worthy. I have learned a lot from the article and the comments herein. The key point is: when will we put in practice the lessons learned? We must not wait until another disaster happens where the victims could be you, me or our loved ones. The new GPS units with TAWs is not expensive at all when considering the price of other spares. It’s FAA approved and quite suited for Nepal operations. A good, functional second hand unit is available for around USD 6,000. Any airline can afford it. Pilots need to learn how to use it and it should be made mandatory for all domestic airlines. Should eliminate CFIT incidents. Thank you Mr. Ashok Bal Tamang for your sincere comments on the ill fated Buddha air’s crash. I have been watching the TV news and some of the comments made by Capt. Y. K. Bhattarai was a bit out of line and not befitting a professional pilot like him. One can never be certain what had really happened to the pilot of that particular flight, one can just ASSUME what might have happened. His supporting the maintenance and capability of the aircraft was also out of line. Please do not forget that the Agni Air’s crash was due to mechanical failure. So how can you say that it is only the mistakes of the pilot? Saying what you know is what people want to hear. Just got some info that this airline has been involved in some rather dubious maintenance practices. Must have paid a lot of hush up money when the CAA found out because they have kept very quiet about it too. A human being ,a person and his/her morale standards is the begining of all the evils in our lifes.Everything else in life is the result ,a sum of errors.There however still would be a chance to a success for aviation if and only if the enforcement of aviation rules was implimented.We must not separate aviation in departments,one is responsible for this and the other for that .Everything is connected and we depend and rely on each other,but again,the people between, the connectors of these departments are the ones who twist the rules and everything else. Behind every button there is a human being with his morale standards.What I am surprised reading these commentaries that no onewants to see beyond the obvious,no one .The stories of complicated threads etc.is all we have invented to give excuses,the consequences of such life style are seen from time to time and the end result are accidents.Again ,the researches and wise analysis is given to why it has happened ,but the only responsible behind all of the accidents,technical,weather or mismanagement is a HUMAN and his morale standards and standards of doing the job,in any job .We hear every day the truths people invent ,reason,excuse but there is only one at all the levels everywhere.Let’s start from ourselves,only! Ok crusader journalist I’ll give you an information that you can act on if you are really serious about helping air safety in Nepal. An Airworthiness Inspector by the name of P. Mallick in the full time employee of the Aviation Safety Department of the CAA of Nepal is also in the official payroll of Agni Air. He does the maintenance of the Agni Air aircraft himself and then as Airworthiness Inspector for CAA of Nepal also approves the aircraft for release! This is done with the knowledge and blessing of all the powers that be in the CAA of Nepal! It’s all official! Can there be a better example of conflict of interests? Don’t you get it Mr.CAA of Nepal,we live in Nepal.This is one of the examples that anything can be made official in our country Nepal and this is one of the examples that this is the exact place where there are no conflicts of interest,this is an exact place as long as it exists,that there never will be confict of interests as it is a place where one can control and earn as much as one wishes and whoever is that person,knows and you know Mr.from CAA of Nepal ,that money is the factor that controls people and their actions.Since you know and are from CAAof Nepal,do the job you are suppose to do,regardless of the consequences for you.CAA of Nepal is a Government Institution,and as long as we have Government officers and leaders who can be paid for, there are not gone be changes .Is there anyone in Aviation in Nepal who dares to speak and act?One can count on fingers have many educated people in the field of aviation there are in Nepal,not the ones who want to do the bizness knowing it brings money and not the ones who has cash and are ready to pay any amount to get what one wants.Every field of work is tricky,one needs to find the balance with ones own morale standards.Just because one is ambitious enough to push another one down the ridge at any cost doesn’t make that person example of success.Unless we do not have Government with strong laws for everyone,there is no chance of improving morale standards.So here is the place where one needs to choose and make a choice of leaders or at least speak up don’t sleep on it. If everyone is so concerned, why is this still happening in Nepal? Why is everyone in this forum writing their thoughts down judging people behind the computer yet not changing a single thing that has been going on. Its sad to see people think so small about others, especially saying pilots having issues. Can you take the time to spell their names right first? Those pilots sacrificed their lives attempting to get passengers from one place to the other. Unless you were in the plane knowing what had exactly gone wrong, you have no say in this. So I’m guessing none of you were there or else you would have been DEAD. Please keep your comments to yourself and try not to disrespect the people that have passed away. -concerened family member of the PRASAI family.